I have a pet quaker parrot called Oscar. He hatched in July 2013 and I took him home at age ten weeks. In the months he has been in my life, he has accumulated quite a vocabulary, for better and for worse. Mostly, he enjoys chewing everything, especially my finger. Speaking of the beautiful game, Tottenham Hotspur is my club. And yes, I know the offside rule, thanks. Sometimes I find strange music on Soundcloud. I drink more tea than is strictly necessary, and then I review it on Steepster. Yelp is where I rant/rave about specific places, mostly food-related. Hidden talents: Fair Isle knitting, singing, acrylic painting, Polish folk dancing, ridiculous knowledge of the London Underground. ...OK, not very hidden. This is the traditional costume of the Biale Podlasie region of Poland. Looks a lot nicer than it feels on a 90-degree day in California. When I lived in New York, I danced at the Waldorf Astoria and in a Broadway theater. I cook an excellent ackee and saltfish. Never-fail go-to karaoke song: "Young Americans " by David Bowie (hurr hurrrrr). It should now go without saying that I can have a laugh at my own expense. I have never been on a rollercoaster, and I have no plan to change that anytime soon, but I truly believe that despite this affliction I will be able to live a fulfilling and meaningful life. Then, in 2016, I made it to the Cup Final of nerd-dom, Jeopardy. 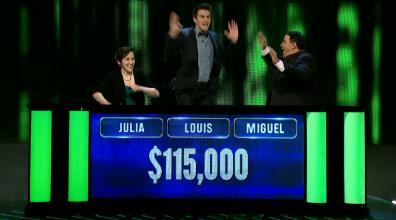 Though I led for my entire game, I lost at the final question, becoming one of only two people in the history of the show to get every Daily Double, go into Final Jeopardy with that much money...and still lose. But I had a great time regardless. Furthermore, I lost to the Queen of Quiz herself, Dr. Cindy Stowell, who tragically died of cancer only weeks before our episode aired. My loss tipped Cindy's accumulated winnings into six figures, and after her passing, her family donated the money to cancer research. Dumbing down education is my enemy.